Last edited by HCA Adoptions on Fri Jun 02, 2017 4:02 am, edited 12 times in total. Hello! I would love to adopt a few more hermies. I live in the West Denver Metro area of Colorado. My family has cared for hermit crabs since 2010. We have a very nice temperature/humidity controlled aquarium with climbing, deep moist substrate, hiding places, salt and fresh water, and all the things hermies love. I am willing to pick up hermies that are within a reasonable drive. Last edited by vitsvan on Wed Jun 27, 2018 11:35 pm, edited 4 times in total. Hello my name is Sandra I have been caring for these Little Cuties for over 15 years I live in Sun Valley Nevada. I know Christa very well I used to be an administrator on her old forum. I have room for are Little Cuties and I am willing to adopt I'm willing to travel My email is sbarnett729 at gmail.com add the word hermit crab adoption in your email. Hi I'm in the Denver area with a 60gal tank. I currently have 4 crabs. And about 12inch of substrate. I'm looking to adopt 3 more crabs. I'm willing to drive 2 hours or so in any direction. He a pic of my tank and I'm still adding more to it. I live in the Denver CO area and I would love to adopt some new kiddos. I am willing to travel about 2 hours. I am currently upgrading to a 75 gal tank and I have three pp crabs. I have been caring for them for 5 years, with many successful molts! I have wanted more but didn't want to shop at the pet stores. Thanks. I have pictures but not quite sure how to upload them. But I can email them if interested. Last edited by Astridsky on Sun Sep 09, 2018 11:25 am, edited 1 time in total. How Far Can You Travel? : 1 hour, clear weather and paved roads, will only meet in a public place, best for all. Size of Tanks, Number of Crabs, and Species: 2 large and 2 medium pps, friendly and with individual personalities! What You Are Able to Adopt? : PPS, any size, 1 or more, we have tanks of various sizes to set up a fresh crabitat to fit what's needed to adapt and eventually mix with new friends! We have adopted before and it's worked out well. 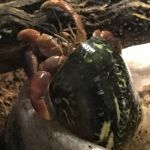 Hermies need friends, if you have an only crabbie, we'll move him or her in with the others as soon as possible, while being careful to let the moving stress pass first, which usually involves a lot of eating, digging, shell shopping and a big healthy molt! I Would Like to Be Contacted By - Email address tinylittle house finch at live dot com, no spaces. Whatever your reason to rehome your pet, the best thing is you are looking for experience in the new home. We'll work to make the transition smooth as possible and send news and photos if you like. Hermies well loved and cared for can live many years, that's the kind of care we offer your hermies, too! I recently set up a 75 gallon tank for my Hermies. I am looking to add a few friends for my 4. The new tank has a large molting pit, lots of things to climb, fresh fruits and veggies, a calcium pit, large fresh water and salt water pools for soaking, a shell pit. Two under tank heaters and a a bubbler to keep the humidity up. They live in a heated room that is dedicated to critters needing a warmer climate. Willing to drive up to 70 miles in any direction! Willing to travel between Monument and Pueblo. 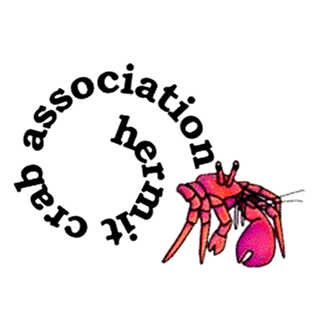 Coming up on 2 years of owning hermit crabs, started with 2 that my stepdaughters "won" at school. Rescued 3 additional off of craigslist over the last year. I'm up to a total of 5 and they range from micro to medium sized. 3 PP and 2 Eccies. I have a 55 gallon tank with 2 hanging (real) coconut hides and various ground level hides made from coconuts, moss pit, both water pools, walkways and plants, tons of natural shells, nightlight lamps, cholla wood, tons of fresh raw/cooked food, no pellets. Blend of sand and coconut for substrate. No judgment here as to why you need to rehome them, happy to help.